In the example below, we're starting fathers - referenced using the contact variable @contact.spouse - in the "Questions for Dads" flow when the expecting mothers reach the second step of the "Registration" flow. This action can also be used to create a new contact through the flow it starts. In the example flow below, Register Patient, contacts are being asked to submit the names and phone numbers of the patient's they're registering. 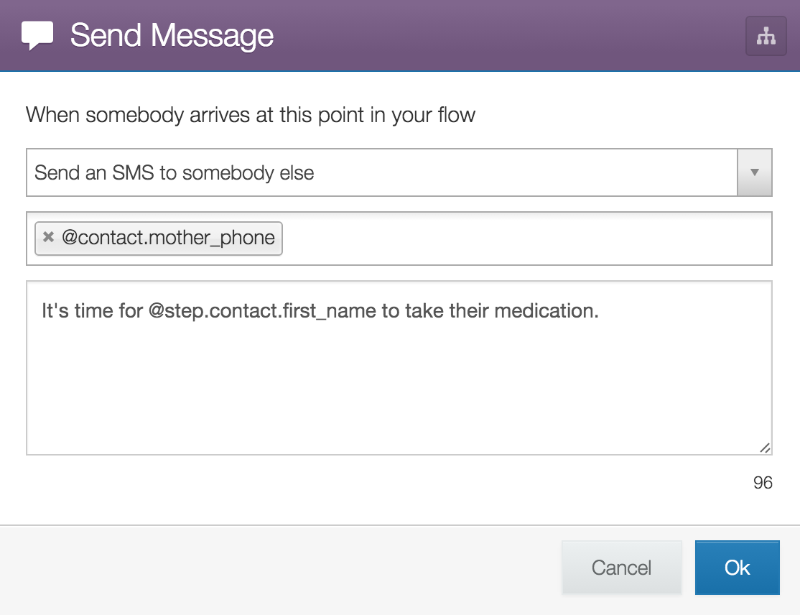 Once that information is collected, the Start Someone in a Flow action triggers a new flow, Create New Patient, that will create a contact whose default fields, Name and Phone, are populated using an Update the Contact action with the flow variables (@flow.name & @flow.phone) collected in the previous flow, Register Patient. The first flow collects the patient's information, while the second flow updates it and creates a contact profile for the patient. 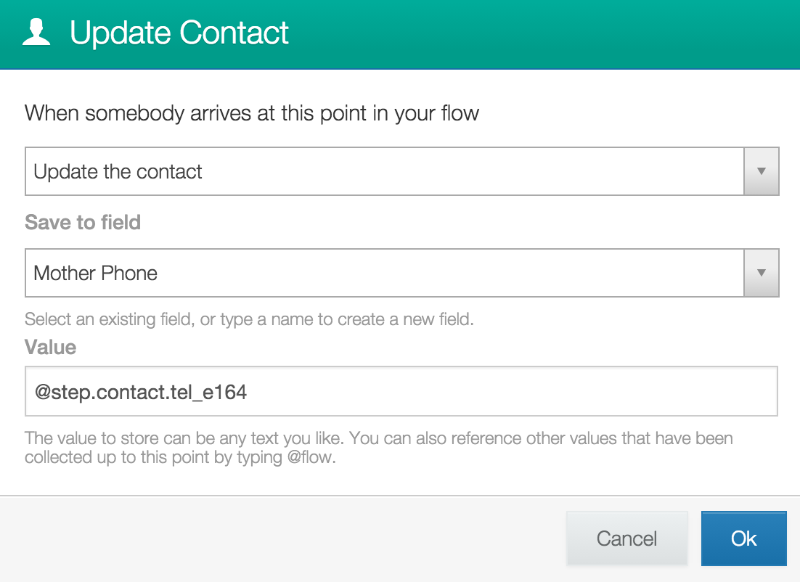 The name and phone number of the new contact is collected, then the new contact's phone number is started down the "Create Contact" flow. Once the new contact's phone number starts the "Create Contact" flow, they'll be added to your contacts tab. You'll just need to update their Full Name field to complete their profile. 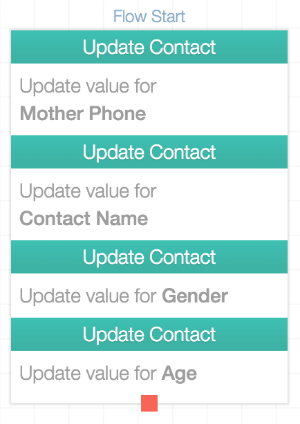 You can do so using an Update the Contact action that places the name collected in the previous flow (referenced using the @parent.name variable; all flow variables from the previous flow can be called by placing "@parent" in front of the variable name) in the new contact's Full Name field. Say you'd like a single contact - an expecting mother, for example - to receive reminders pertaining to her pregnancy as well as reminders pertaining to the medical care of her other children. The key is to create separate profiles for each child, all containing the mother's phone number, so that she can receive campaign events for each of her children. Once each child's contact profile is created, you can assign them their own campaign.